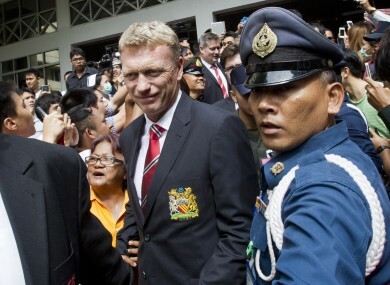 Manchester United began their pre-season tour with a loss in Bangkok this afternoon. DAVID MOYES’ REIGN at Manchester United began with an embarrassing upset this afternoon as his highly paid squad of players slumped to a 1-0 defeat against Thailand’s Singha All-Star XI in Bangkok. The new manager sat grim-faced on the bench as the feted visitors, who have been given a hero’s welcome in Thailand, failed to recover after falling behind early in the second half. The Premier League champions cannot even say the goal was against the run of play after scorer Teeratep Winothai had had two of the best chances of the game up to that point. The result, albeit in a meaningless friendly and with a youthful team, will not ease the task of Moyes as he seeks to follow Alex Ferguson’s 27-year, 38-trophy stint at the world’s most famous club. Moyes played Danny Welbeck as a lone striker in his first line-up, weakened by a number of absences including Robin van Persie and the unsettled Wayne Rooney, who abruptly left the tour with a hamstring injury. And it was the host team, comprised of the best players from the Thai league, almost seized the initiative when Teeratep raced through early on only to be denied by Jonny Evans’ last-ditch tackle. Eighteen-year-old Belgian debutant Adnan Januzaj was United’s stand-out player in the first half, showing a full range of tricks and passes, but he spurned their closest opportunity when he volleyed over from a Fabio cross. Slow handclaps and the dreaded Mexican wave pervaded Rajamangala Stadium and the stuttering visitors’ cause was not helped when leftback Alex Buttner went off holding his right thigh. Teeratep drew the best from Ben Amos when his fierce shot was palmed away by the United goalkeeper, in what turned out to be the nearest either side came to scoring in the first period. United were expected to up the tempo in the second half but it was Teeratep, the diminutive Bangkok Glass forward, who shattered the deadlock when he beat Amos at his near post on 49 minutes. Januzaj fired a half-chance at Thai goalie Narit Taweekul and Wilfried Zaha, the exciting new signing from Crystal Palace, should have done better with a far-post header with 15 minutes left. Inside the last 10 minutes, England striker Welbeck brought down a raking Giggs cross with great control but he then contrived to push an easy shot wide, and Zaha rattled the left post as United pressed in vain. Moyes will hope for better from his players on the rest of the trip to Australia, Japan, Hong Kong and Sweden, before they begin their Premier League title defence on August 17. But he can at least console himself that Ferguson’s time in charge also started inauspiciously, with a 2-0 defeat at Oxford United in 1986. Email “Moyes era starts with embarrassing defeat to Thailand All Stars ”. Feedback on “Moyes era starts with embarrassing defeat to Thailand All Stars ”.